« Biased Leading Questions Can Be Worse Than Outright Lies. False Contexts Are The Worst. Is The United Nations The Greatest Enemy Of The Climate? In its latest report on climate change, October 2018, UN now claims that climate warming caused by human activities is reversible. That absurd claim is much more damaging than Trump clownish positions on climate change and coal. And yet, contrarily to what UN scientists claim, overshooting the target, and then cooling off will probably not work, because of nonlinear effects. Once ice is gone, ice doesn’t come back easily. Climate change, so far, has been linear: every year a bit warmer, a bit more CO2. That’s not the main problem. The main problem is that the planet could switch to a Jurassic regime. The UN scientific report on climate change claims that, in the likelihood that governments fail to avert 1.5 degree Centigrade (2.7 degrees F for US primitives) of warming, another scenario is possible: The world could overshoot that target, heat up by more than 2 C (3.6 F) degrees, and then through a combination of lowering emissions and deploying carbon capture technology, bring the temperature back down below the 1.5C (2.7F) degree threshold. In that utopical UN climate round trip scenario, some damage would be irreversible, the report claims. (yes, sure, *some*). All coral reefs would die. However, the sea ice that would disappear in the hotter scenario would return once temperatures had cooled off, bleats the UN… The ice will return? This is unproven and most certainly FALSE: once the albedo of the Arctic is changed, it won’t come back, and the Arctic ocean will heat up. The Arctic ocean already contains enough heat 50 meters below its surface, to melt said frozen surface completely. 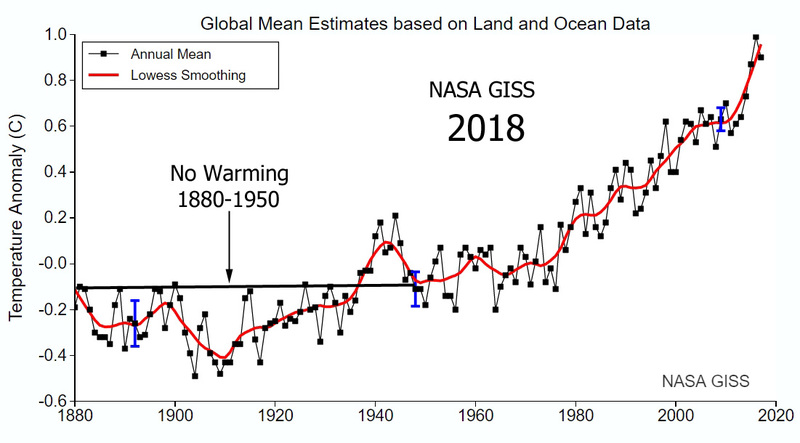 The global temperature graph up to 2018. One seems to see an overall acceleration, a nonlinearity, an exponential drawing itself… Exponentiation is the typical nonlinearity. “For governments, the idea of overshooting the target but then coming back to it is attractive because then they don’t have to make such rapid changes,” Dr. Shindell, a climate scientist at Duke University and an author of the report, said. “But it has a lot of disadvantages.” Yeah: like it won’t happen. Cheap enough CO2 capture, for example, doesn’t exist. The report was written and edited by 91 scientists from 40 countries who analyzed more than 6,000 scientific studies. The Paris agreement set out to make a big wishful thinking about preventing warming of more than two degrees centigrade (3.6 degrees Fahrenheit as US primitives have it) above preindustrial levels — long considered a threshold for the most severe social and economic damage from climate change. Heads of small island nations, hounded by rising sea levels, also asked scientists to examine the effects of 1.5 C (2.7 F) degrees of warming. To prevent 1.5 C (2.7 F) degrees of warming, the report said, greenhouse pollution must be reduced by 45 percent from 2010 levels by 2030, and 100 percent by 2050. It also found that, by 2050, use of coal as an electricity source would have to drop from nearly 40 percent today to between 1 and 7 percent. Renewable energy such as wind and solar, which make up about 20 percent of the electricity mix today, would have to increase to as much as 67 percent. These requirements are not planned by most of the industrialized world. The report concluded that the greenhouse gas reduction pledges put forth under the Paris agreement will not be enough to avoid 2C (3.6 F) degrees of warming. Despite the policy implications, which go against Trump’s climate skepticism stance, the United States delegation joined more than 180 countries on Saturday in accepting the report’s summary for policymakers. A State Department statement said that “acceptance of this report by the panel does not imply endorsement by the United States of the specific findings or underlying contents of the report… We reiterate that the United States intends to withdraw from the Paris agreement at the earliest opportunity absent the identification of terms that are better for the American people,” the statement said. The Trump position has been that a number of provisions of the Paris Accord, such as a 100 billion fund to help the Third World, are unacceptable. However the fact remains that, after Obama’s giant fracking effort, major US states have the most ambitious sustainable energy programs (especially mighty California). The UN scientific report emphasizes the necessity of a tax on carbon dioxide emissions. “A price on carbon is central to prompt mitigation,” the report concludes. It estimates that to be effective, such a price would have to range from $135 to $5,500 per ton of carbon dioxide pollution in 2030, and from $690 to $27,000 per ton by 2100. The cost of fossil-fuel emissions rose to its highest level in more than a decade in Europe, in August 2018, surpassing 20 euros a ton ($23) and adding to the cost of electricity across the continent. Carbon emission permits have more than quadrupled from less than 5 euros since the middle of 2017 after European Union governments agreed to cut away a surplus that had depressed prices of the CO2 permit market since the financial crisis that started in 2008. Utilities and industrial polluters need the certificates to cover greenhouse gas emissions they produce. By comparison, in fossil fuel happy USA, under the Obama administration, government economists estimated that an appropriate price on carbon would be in the range of $50 per ton (but they did nothing, as usual in Obama’s administration). Under the Trump administration, that figure was lowered to a ridiculous $7 per ton. Those with Trump Derangement Syndrome will say: we told you so. However, in the area of climate change, Trump is mostly wind: he used to be a climate alarmist (not as bad as yours truly). Now Trump has skeptic, because it brings him votes (but in truth he does nothing, same as Obama). Whereas what the UN is doing by claiming climate change can be reversed, (with sci-fi technology) is diabolical… and will hogtie leaders such as… Trump: how can one justify thorough changes in all of society, while being told, by the UN it’s all for nothing, it’s not necessary? What is going on? A form of ubiquitous corruption: scientists who authored the UN report are all, directly or indirectly, government employees. They want to please their employers, so that they can be paid, be influential, and honored. Those employers themselves are trying to please their plutocratic masters (and future employers). So they engineered a completely unrealistic wishful loophole, resting on non-existing technology (efficient, cheap, mass, planetary sized CO2 capture). Now the UN has done even worse: it claims that climate disasters are coming, but won’t cost that much (1% GDP for 1C of warming), & they are reversible. BS! This entry was posted on October 9, 2018 at 11:37 am and is filed under Apocalypse, Climate Catastrophe, Climate Change, CO2. You can follow any responses to this entry through the RSS 2.0 feed. You can skip to the end and leave a response. Pinging is currently not allowed. I clicked on ‘Like’ only in terms of your stark message. The truth is that we have very little time to do anything. So …. can you possibly think of actions that could be taken? Realistically, within the terms of our democratic society? Let me take a while learning of the issues involved. Your insights on this issue are on target. This issue gets pushed aside continuously by the fossil fuel industry and its captives in government and the media. The alarm gets drowned out by all the static – denialism, false equivalency, and general lack of understanding. If only the word was easier to get out and gain acceptance. Those scientific whores are anxious to please their masters, they are selling hope to the fossil fuel establisment. Nothing new here, remember the middle age scholastic with angels on a pin, while those who thought different were burned alive? That lasted 1,000 years. In theory, it is reversible. It is, unfortunately, a massive task because we have to undo the burning of 9 Gt/a of carbon, and the differential of carbon burning wrt to time is still positive. The problem is we do not have the technology right now to do it, but we do have some technology that will buy us more time, and the should be implemented where possible. But nothing much gets done because the average politician has no long term vision at all. I do not see democracy as solving this, because when faced with a problem in fifty years or their work closing down right now, or taking twice as long to get to it, how are they going to vote? Voting tends to be on single issues, and hence becomes fragmented. Since then the CO2 production has AUGMENTED. Disclosure: not a physicist, and have been hearing forecasts of climate doom for 30+ years that didn’t happen, and have trouble with the current forecast when there is credible evidence (?) that we’ve reached these temperatures well before the industrial age and that they reversed endogenously. Also, I read that *all planets in the solar system are warming,” so the root cause of our warming could be the result of changes in solar irradiance (https://www.livescience.com/1349-sun-blamed-warming-earth-worlds.html). I’m sure this latter view has been suppressed since its original publication. Having said all that, I would prefer stiff penalties on excessive emissions to a tax, as the governments of the developed world have proved to me that they should not be given any more money. Optimally these penalties would be enacted by direct democracy so there would be ground-level “social enforcement” as there used to be about obscene executive compensation. Lots of neocon brainwashing to undo. The idea of penalties instead of a tax is that everyone faces the same constraints; the big boys don’t get to buy a different set of rules. An economist might say this is less “efficient” but (speaking as an apostate one) I like the simplicity and egalitarianism of my solution. The idea of handing money over to the military-industrial-security-social-credit-scoring-news-censoring fascist ruling neocon complex gives me the shivers. Pray that Xi’s vision of the “technologically managed” society doesn’t make it in the West (a vision which Google seems to favor, their CEO recently extolling the benefits of censored search). “All planets in the SS are warming is disinformation by the fossil fuel industry… and a long story…” Some say: where is the warming? Well, clearly, in the graphs… It’s also unavoidable as we went from 280 ppm CO2 to nearly 500 ppm in equivalent CO2. Finally, an exponential always starts nice. We are just in the beginning and in glaciated places, the NONLINEAR boost to warming has already started.